Posted by Bravado Cooking for Men in Classic Grilling Recipes, Recipes. Summertime is upon us – women look better, beer tastes colder and, for some reason, we’re drawn like a magnet to the outside grill. So, make sure you take a second look at our famous Six-Pack Chicken and try another grilling classic – Argentinean flank steak. This is a relatively easy dish that you can prepare in about 90 minutes. 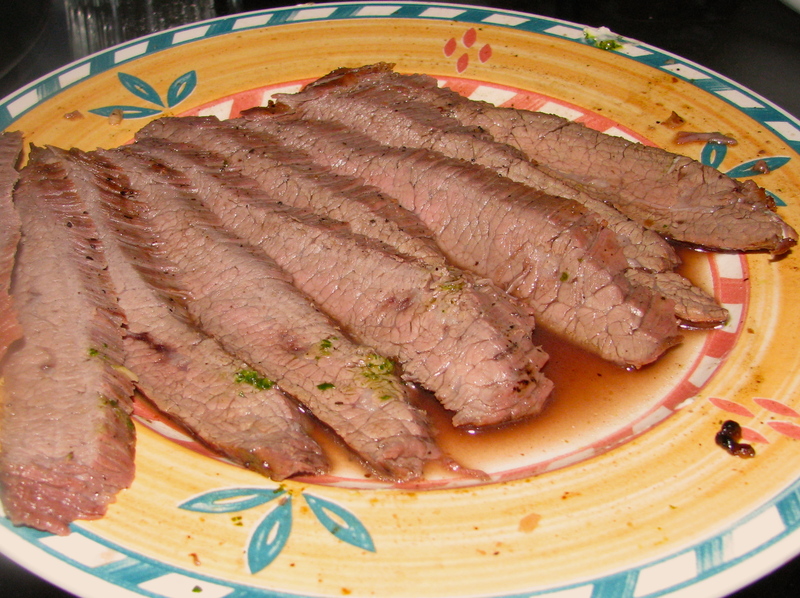 A flank steak is usually about 1-1/2 lbs. and serves four. Adjust the recipe below depending on the number of people. To prepare, coarsely chop the garlic and mix with the other ingredients. Put the flank steak in a gallon size zip lock bag. Pour the marinade into the bag with the meat and seal. Agitate and massage the meat so it is well covered. Leave for about 60 minutes at room temperature before grilling. Tech Stats: Most marinades do not tenderize meats; so don’t listen to the tales of meat steeping for two and three days in exotic oils, vinegars and spices. If the marinating process takes place in the refrigerator, there is little hope of tenderizing since the enzymes that do work need to reach a temperature of about 140 degrees to function. If you marinate at room temperature for an extended period, you risk bacterial growth. Marinades infuse flavors, but only on the surface of the meat, which does not take long – generally about 30-60 minutes. The best reason to use a marinade is to control HCA’s (heterocyclic amines) – those nasty cancer causing compounds produced when flame-grilling meats. A great marinade for this purpose is one that uses lemon juice. This is because “immersion in an acid-based marinade for as little as forty minutes resulted in a decrease of 92-99% of heterocyclic amines (HCAs) in recent tests by the American Institute for Cancer Research”. You can use your marinade to baste the meat while cooking because the heat from the grill will kill bacteria picked up from the raw meat. You can also use the marinade as a sauce as long as you boil it for one minute. While the meat is marinating, prepare the sauce, which is the key to this dish. The Argentineans have always made some wonderful herb-based sauces for grilled meats. This should not be surprising since they are the world masters in barbecues. One of their best sauces is Chimichurri, a slightly spicy green sauce that is always – repeat always – found on the table in any good Argentinean restaurant and in every home. ¼ cup fresh oregano (preferably Mexican big leaf), or two tbsp. of dry. Tech Stats: Cumin and Cilantro not only are important for flavor, but also have important significance for health. Both are strong anti-bacterial agents. For this reason, they are used throughout the world in areas where hygiene is compromised. They not only taste good, they help make sure guests don’t have to make an early exit. Cilantro is an especially incredible herb – it has been used for over 5,000 years. It is especially important in preparing meats since it is proven to protect against salmonella. According to the U.S. Centers for Disease Control, salmonella is responsible for most cases of and deaths resulting from food poisoning. Wash the herbs and drain in a colander. Remove large stems from parsley. Remove only the largest, most woody stems from the cilantro since the stem of this herb is very tasty. Put everything in a food processor or mini-prep and blend well. If necessary, add more olive oil until you have a runny paste – the ¼ cup is just an estimate. However, don’t get it too thin and oily. This sauce, although used generally on grilled beef, can be used on anything. 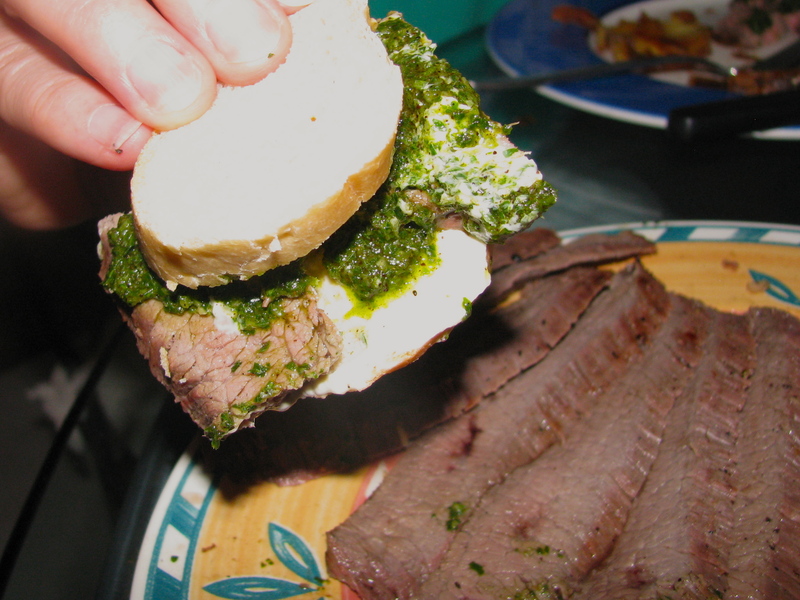 Buy a French baguette and offer your guests an appetizer of Chimichurri on thin slices of bread. If you plan to do this, you will need to double the recipe since the demand for this appetizer will surprise you. Now you are ready to cook the flank steak on your gas or charcoal grill. Take the steak out of the bag and reserve the marinade in a small bowl. Make sure the grill is good and hot (over 400 degrees) and cook about 6 minutes per side. The meat should be slightly pink on the inside. Baste with the reserved marinade when you first put the steak on the grill and when you turn it over. Cut the meat across the grain at a 45-degree angle. This cuts the tiny tendon fibers and makes the meat easy to eat. The slices should be no more than 3/8” thick. Serve each guest about three slices of steak with a dollop of Chimichurri sauce. Give them some baguette slices so they can make slider sandwiches.M ake sure you have more sauce for the table since everyone will ask for more.